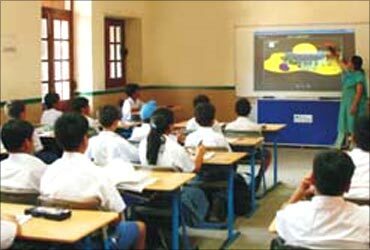 Keeping pace with students who are becoming more tech-savvy, schools in India are taking to the concept of digital classrooms - a new education technology that assists teachers with course-ware and maintenance support in digital format. When Mrinalini Kaura, the principal of Venkateshwar International School (VIS) in Dwarka, New Delhi, heard of this concept, she did not think twice before digitising 45 classrooms. Barely a few months into revamping the classrooms, Kaura was so impressed with the results that she plans to implement it in the remaining 23 classes of her school. Kaura says she sees digital classrooms as the way ahead for all schools because it makes both teaching and learning simple: Better assessment system, real-time paper evaluation and abstract concepts made easy to understand. 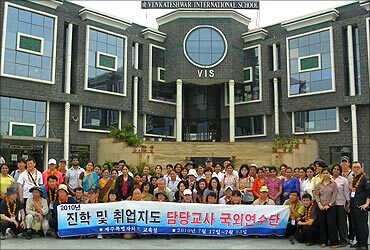 VIS is not the only success story with Educomp Solution's smart class in its classrooms. Several schools in Ludhiana - including Kundan Vidya Mandir, Satpaul School and BCM School - too, have caught up with the trend and are experimenting with technology to impart knowledge to up to class VIII students. 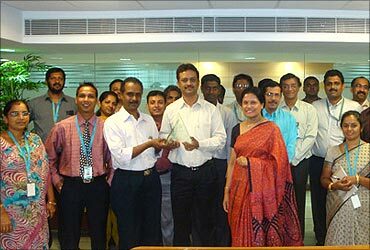 Educomp, till a few years ago, was the only player in the digital classroom segment, but today the market has over half-a-dozen players - like Everonn Education, EdServe Softsystem, Core Projects and Technologies, NIIT and Manipal K-12 Education - who have made learning easy through IT-enabled systems. There's no denying the fact that schools and educational institutions are waking up to the opportunity of IT-based solutions and service providers are reckoning its potential. Chennai-based Everonn Education lists its growth plans for its iSchool. "This segment will see huge growth in the days to come. At present, we are in 1,370 schools. We plan to take that number to 5,000 schools over the next three years," says P Kishore, founder and managing director of Everonn Education. Educomp has 5,534 schools - including Delhi Public School and Bal Bharti in New Delhi - and 3.9 million students using its Smartclass solution. 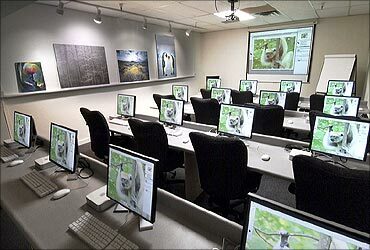 The digital classroom services include: setting up of infrastructure and technology in schools; providing digitised course-ware and maintenance support to teachers; educating teachers and the management on technology usage and conduct special interactive sessions, sometimes through VSAT. The market has evolved with the Central government's move to fund Sarva Siksha Abhiyaan for ICT@Schools programme with a Rs 15 lakh per district per year budget. Under the government's Technology in Education Initiative, out of a total 10,00,000 schools in the country, the programme will cover 6,42,600 schools at the primary, upper primary and secondary levels. Every school will have a server, five PCs, printer and internet connectivity. State governments will outsource installation and maintenance of hardware, content and training to a private party. The information and communication technology (ICT) business is tender-based. It functions under the build/own/operate/transfer model. Many service providers are using the powerful channel of 3D animation videos to explain concepts like formation of block-mountains or volcanic formation. And, schools are using the available technology to explain and simplify concepts in subjects like Chemistry, Physics, History, Biology and Science. "The key is to make learning as interactive as possible," says Kaura. According to analysts, visually improved presentation through use of graphics increases students' interests in classrooms. With more and more companies realising the potential, analysts expect the market to grow ten times in the next five years. ICT inflows to private-sector players is pegged at around Rs 4,500 crore (Rs 45 billion) by March 2012. The service charges vary for each player. For instance, while Educomp charges between Rs 155 and Rs 160 per student per month (for an average class comprising 40 students), Everonn charges Rs 15,000 for one classroom. Everonn, however, provides a 50 per cent subsidy if it caters to the needs of more than five classrooms in a school. Industry experts believe that by March 2013 around 200,000 public schools will be able to offer computer training to their students. While Educomp did not divulge how much it spends on digitising an existing classroom, Everonn said renovating each classroom costs between Rs 60,000 and Rs 100,000.